SL Huang has a Twitter account. 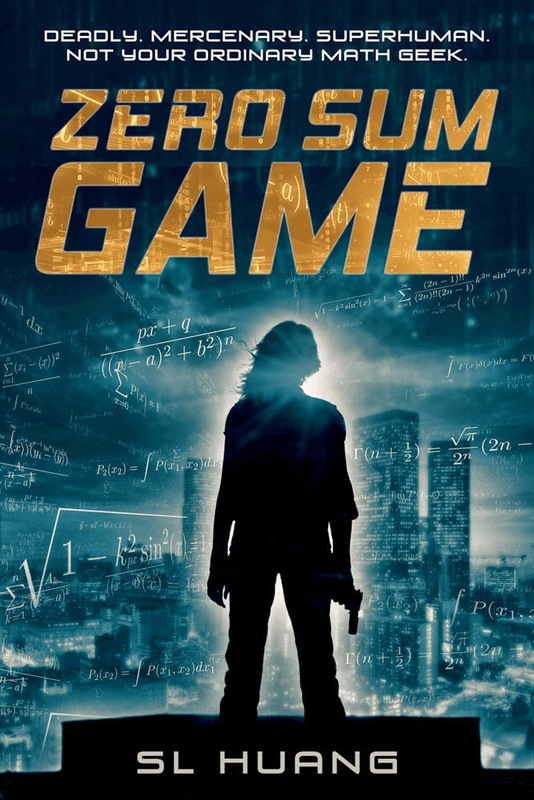 One day, SL Huang talked about her new book, Zero Sum Game. I said, "Hey, why don't I have that in my pile of books to read for review," and she said, "Well, fine, I'll put it in your inbox you complaining whiny person." Thus began a glorious literary friendship. Of course, that story isn't exactly what happened, but it's the version I'm sticking with for now. In truth, I came to Zero Sum Game with a lot of expectations: I wanted a fun, adventurous book with crisp, commercial writing, exciting characters, and a larger-than-life crazy-face plot. And that's exactly what I got. This is the kind of book I would turn to if I needed a break from life. It's the kind of book I can get lost into, like an action thriller that doesn't try to be artsy, but still has a lot of heart. This book is like Bourne Identity, but if Matt Damon were replaced by Michelle Yeoh (or JeeJa Yanin) and all of her extraordinary fighting skills were explained by her superhuman ability to almost instantaneously calculate the physics of the world. Zero Sum Game is an enormously entertaining book. When I described Huang's prose as "crisp" and "commercial," I meant that in the positive sense. Rather than falling into the trap of "too little to describe too much," Huang's narrative employs the first person perspective to channel her characters without overwhelming the action-oriented, deeply-genre plot with what has sometimes falsely been described as "purple prose" (i.e., fluid, provocative prose of the sort found on the extreme end with Thomas Pynchon). Zero Sum Game captures the essence of Russell's character in her internal dilemmas without sacrificing detail or character, facilitating the natural development of the action-oriented sequences and the characters trapped within them. This makes for a book that is as gripping in its presentation as it is in its genre qualities. A space opera analogue might be Tobias S. Buckell, whose Xenowealth novels find that beautiful blend of action and science fictional exploration. Huang's novel is equally as engaging. Indeed, Huang's narrative voice captures something that I think would otherwise fail in third person: special abilities that are only visible within a character's head. Cas' unique math-based abilities only work if they can be portrayed realistically and with sufficient flare to escape what otherwise might read as ridiculous. Huang handles this primarily through Cas' sometimes smartass (OK, frequently smartass) attitude, which provides a certain depth to her abilities: they are old-hat to her, and so the narrative limits the need to explain everything through Cas' nonchalant view of mathematics (though, of course, the narrative does explain some things, as it must). This isn't to suggest that the approach is wholly effective. There are moments where I do think the narrative needs to provide more explanation, especially when chapters jump forward without addressing the sometimes crucial "how we got here" elements. What isn't important to Cas, generally speaking, isn't important for the narrative, it seems, which means sometimes the reader is forced to jump forward when a more measured "hand" may be more apt. But the strategy is overall a success, as I found Cas believable and sympathetic despite her seemingly anti-social view of the world. In that regard, one of the primary weaknesses in this book is its ending. Huang spends much of the book setting up the climax by slowly revealing details to Cas as she investigates Dawna, the aforementioned super psychic who has pulled the proverbial wool over Cas' eyes. In the process, we learn about her friendship with Rio, a known serial murderer who believes he is doing God's Will in Dexter-like fashion, Arthur, an ex-cop-turned-PI who finds Cas' methods questionable, but mostly goes along with it out of necessity, and Chester, a differently-abled computer nerd with an oddly charming personality. These characters form the bedrock of the narrative, which ultimately leads the reader to a city-wide disaster in Los Angeles, as Cas, Arthur, Rio, and Chester try to foil Dawna's plans. For me, the climax made sense, but the resolution seemed rushed, particularly as it raises a number of new questions about Cas and Rio's relationship; it also responds to an ethical dilemma with which the characters are forced to struggle: if stopping one group will lead to greater ramifications the globe over, is it worth it? Cas' response is a resounding "yes," on the grounds that Dawna and her people are making choices for everyone when she has no such moral authority. The attempts to rationalize the decision is an interesting, as it counters the oft-repeated Spock saying: "The needs of the many outweigh the needs of the few or the one." Here, Huang retreads with, "The knowledge of the many outweighs the needs of the same." I particularly liked that Huang decided to deal with this aspect, particularly since most narratives of this form tend to ignore the wider ramifications of actually defeating "the bad guys." However, while I imagine there will be more novels in this world, I think the Cas/Rio aspect would have functioned better if it had appeared much earlier in the novel, giving it time to germinate like a little literary weed. Indeed, given the scope of what happens in the novel, it is strange that so little of post-climax cleanup actually deals with the full ramifications for the world and for the characters; Cas does tell us about these things, but it seemed too clean to me. If you're looking for an exciting thriller with a side of weird scifi "superpowers," this is most certainly the book for you. Go on...buy it. P.S. : As a general rule, I do not review self-published books. This book is self-published, but those who have issues with such things would do well to ignore its publishing history. It's just a damned good book. In fact, Angry Robot Books should send Huang a letter and offer a 5-book deal or some craziness like that. It's so much fun. Really. Every once in a while, I really just want to sit down, get sucked into a fun book, and not come out for a while. This book let me do that.